The best writers don’t set out to understand Reagan in himself—the frustration of the undertaking is what twisted Edmund Morris’s authorized biography into a fictionalized memoir—but to study him in his relations, as befits a politician. Here are the five books anyone interested in learning more about Reagan should start from. (1.) Donald T. Regan, For the Record: From Wall Street to Washington (1988). In his history of the ’seventies, David Frum said that former members of the Reagan administration created a “new American style”—the political memoir that has “some cruel or hurtful story to tell about the president they had served.” The best of these was published by Donald Regan, treasury secretary and chief of staff under Reagan. It is notorious for breaking the story that Nancy Reagan consulted an astrologer while in the White House, although it is far more noteworthy for its firsthand detail about the President at work. The book is surprisingly compelling, probably because it was ghost-written by the novelist Charles McCarry. (2.) Lou Cannon, President Reagan: The Role of a Lifetime (1991). Cannon started writing about Reagan while covering Sacramento for the San Jose Mercury News. Since his first book on the political standoff and cooperation between then Governor Reagan and Jesse Unruh, speaker of the California state assembly, Cannon has written four more. His biography of Reagan during the White House years is the best single volume about the tumultuous and transformational presidency. A friendly critic, Cannon is rarely unfair to Reagan. Liberal readers, hoping for a harsher portrait, will have more to complain about than conservative readers. (3.) Reagan, In His Own Hand, ed. Kiron K. Skinner, Annelise Anderson, and Martin Anderson (2001). The most unexpected and astonishing discovery about Reagan since his death is that he was a writer—not just a good writer, but pretty nearly a non-stop writer. “He was constantly writing,” recalled Dennis LeBlanc, a member of Reagan’s security detail from 1971. “He would always fly first class. He’d sit by the window, and I’d sit in the aisle seat next to him. It didn’t matter whether or not there was a movie being shown and all the lights were out—he’d turn on his reading lamp and would be constantly writing.” A young historian found the scripts to over a thousand radio broadcasts that Reagan delivered between 1975 and 1979. Along with a few speeches, some early writing, and a few other things—including the public announcement of his Alzheimer’s, which Reagan wrote and delivered for himself—these provocative and revealing scripts are reprinted, without editorial correction, in this unique book. The one indispensable title in any Reagan collection. (4.) Paul Kengor, God and Ronald Reagan: A Spiritual Life (2004). Reagan was a Christian, but he neither attended church with any regularity nor did he publicly “witness” to his faith. Yet he appealed to believing Christians, because they recognized the religious tones in his voice. 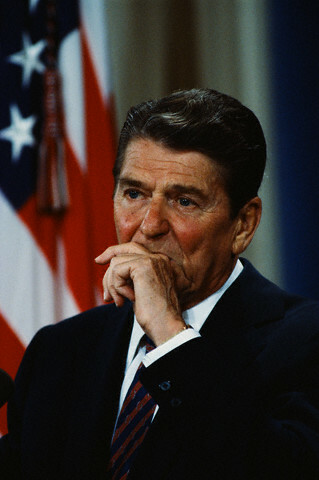 Kengor, a University of Pittsburgh-trained political scientist, shows that Reagan’s religious faith was central to his political thinking and policy decisions. He also tackles the problems raised by Nancy Reagan’s dabbling in astrology, as revealed by Donald Regan (above). The coherence of Reagan’s political career comes into focus after reading Kengor’s book. (5.) Thomas W. Evans, The Education of Ronald Reagan: The General Electric Years and the Untold Story of His Conversion to Conservatism (2006). Missing from the archives are the transcripts of the hundreds of talks that Reagan gave to General Electric employees from 1954 to 1962, while he was a public spokesman for the company. Evans supplies the missing link in Reagan’s career. From his time as the anti-communist president of the Screen Actors Guild to the famous speech at the Republican national convention in 1964, which shot him into national political prominence, Reagan quietly metamorphosed from a Roosevelt Democrat into a Goldwater Republican. Evans tells the story thoroughly and well. When he was a boy, Reagan’s favorite book was apparently Harold Bell Wright’s Printer of Udell’s, a 1903 novel about an orphan who becomes a Christian. As an adult, he preferred the Western novels of Louis L’Amour, upon whom he bestowed the presidential medal of freedom in 1984. The “serious” poets and novelists, who reviled him while he was president, were ignored by him in return.